I don’t know what kind of hero I am but I suspect that I’m more like Barry Allen than any other fictional hero. Barry is optimistic. He’s driven. He’s fun, lighthearted, cares about his friends and family deeply. He wants to protect others and he hasn’t been jaded by the world as much as some people have. He didn’t have to be forged in fire or life experience. He literally woke up one day with a superpower. He didn’t ASK to be a hero; he was CHOSEN to be one. In the pilot episode of The Flash, we see and hear this quite clearly: when the particle accelerator at S.T.A.R. Labs explodes, it hits the crime laboratory where Barry is working. A bolt of lightning hits him, sends him into a coma, and when he awakes – nine months later – he’s the fastest man alive and, as he soon discovers, not the only one of his kind. But before we dive into a discussion of Barry in the pilot, let’s talk briefly about what makes The Flash so different from Arrow and what makes Barry and Oliver Queen such different kinds of heroes. I love Barry Allen because he’s got a good heart. He’s always concerned about other people and that is always his first instinct. His first instinct is not self-preservation. That’s always Oliver’s first response and it’s natural, given the amount of time he spent on the island and in Hong Kong, forced to do whatever it took to survive. Oliver was forced into becoming a hero, his soul blackened and body bruised and soul scarred because that was the only way. Before the island, Oliver was… well, making some morally questionable decisions. Barry, though not a saint, seems to generally make the right decision – he’s the do-gooder. The Flash is constantly a show about optimism and hope; Arrow is a show that is often very gritty in its realism. There are no characters who laugh as they name and label “metahumans.” In Arrow, everything is always dark and dire (with some exceptions). Even the humor on the show is often more biting and sarcastic than the goofy humor on The Flash. It doesn’t mean that one show is better than the other and it certainly doesn’t mean that one hero is somehow better than the other. If we learned anything from The Flash/Arrow crossing over this year it’s that Barry can learn a lot from Oliver and needs to continue to allow himself the humility to learn from others. But Oliver can learn a lot from Barry, too. Barry still looks at the world and sees it as full of mostly good people… including Oliver. And Oliver? Well, he wishes he could be the kind of hero that Barry can be – the kind who didn’t have to suffer, who was chosen instead of forced to become “something else” (I couldn’t resist). Both heroes need each other for support, as the pilot of The Flash displays quite clearly. Who is the first person that Barry leans on for support when it comes to being a hero? Oliver. Remember of course, if you also watch Arrow, that this rooftop conversation takes place directly after the events at the hospital in “The Calm.” So Oliver is still fresh from his sort-of-breakup with Felicity. And yet, he manages to offer Barry words of advice: he tells him that he was chosen to become a hero and that Barry can impact Central City in a way that Oliver cannot – acting as a guardian angel, essentially. Where Oliver is a vigilante, roaming the streets during the nighttime to put away criminals, the implication here is that while Barry may want to invest in a mask, he’s going to be the kind of hero who watches over others and comforts them, protecting them, helping them. But before Barry Allen is struck by that fateful bolt of lightning, he’s a relatively normal young man. There’s one notable exception: his father is in prison for the murder of Nora Allen – Barry’s mother and Henry’s wife. Because Henry is serving time in prison for a crime Barry is convinced he did not commit, Barry was raised by Joe West – the father of Barry’s childhood best friend, Iris. 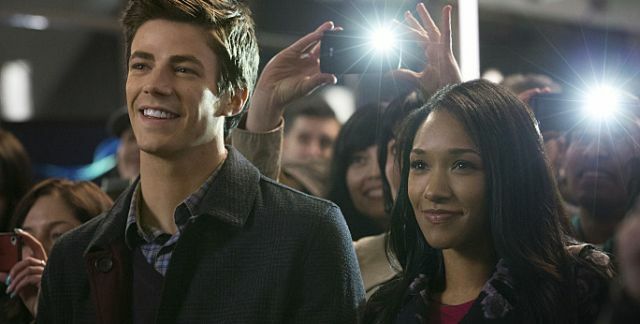 Barry and Iris are still best friends (more on them throughout this #SummerRewatch series) and rely on one another for support and encouragement and comradery. They’re yore than friends, actually: Iris is Barry’s family. And Joe is Barry’s family, too. Knowing what I know now, re-watching The Flash’s pilot was illuminating in terms of the relationship between Joe and Barry. There was a moment where Joe actually yelled at Barry and it was kind of jarring because I don’t recall too many moments later in the season where Joe acts this aggressively toward the young man. But despite their differences and disagreements, Joe and Barry love one another. Joe constantly supports Barry and treats him just like he does Iris – his own child. Joe may not be Barry’s biological father, but he’s still his parent: the one who keeps a watchful eye, the one who doles out advice and occasionally harsh truths. The one who supports and loves at the end of the day. That’s the kind of relationship that Joe fosters with Barry and it’s absolutely wonderful. I have no doubt that the combination of how Barry was raised up until his mother died and how he was raised under Joe’s roof allowed him to become the heroic young man that we meet in the pilot episode. Because even before Barry puts on a suit and a mask, he’s a hero. He’s doing what he can as a forensic scientist to help the world and make it better. He wants to solve his mother’s murder and prove his father’s innocence. He believes in happy stories. It’s why he and Felicity Smoak get along so well together. But once Barry is hit by that bolt of lightning, he changes. He becomes The Flash: a young man with superhuman speed. And because of the coma that the lightning put him into, he’s monitored until – and after – he wakes up by a trio of S.T.A.R. Labs employees named Dr. Harrison Wells, Cisco Ramon, and Dr. Caitlin Snow. Do you ever go back and re-watch pilot episodes of your favorite shows? With Friends now readily available on Netflix, I did that recently and it struck me how young and how different everyone was. The same holds true in the case of The Flash, to an extent, even though the series is only a season old. Caitlin is much colder (pun intended for those who know what I mean) than she is during the later episodes and with good reason: at this point in the story of the show, it’s only been nine months since she lost Ronnie and since her career and boss deteriorated. Harrison is a lot harsher than I remember him, too, and a far cry from the man we meet early in the episode pre-particle accelerator explosion. That man was charismatic and charming. The man we meet in the wheelchair? He’s… curious. But he makes it clear that Barry is not a hero. Cisco is the character who changes the least in some ways: he’s still extremely energetic, fun, and doesn’t take anything seriously. At the end of The Flash’s first season, we still see that part of Cisco, but we also see a very serious, very determined, very intentional young man in the season finale. Cisco is brilliant, that much is certain, and he doesn’t take life seriously at all in the pilot which is – I think – his way of coping with all that happened. His boundless energy and enthusiasm is what keeps him going from day to day. Unbeknownst to Barry upon meeting them, these people will change his life in ways he cannot even comprehend. And it’s fun to see little hints of that sprinkled throughout the pilot. Pilot!Barry and finale!Barry are similar in a lot of ways: both are desperate to save the people they love, both still believe in hope and goodness, and both fight for humanity and for themselves. That hope is what carries Barry throughout the entire season. It’s what causes him to realize that he has a purpose. It’s what gives him strength. And the support of Dr. Wells, Cisco, and Caitlin allow Barry to begin on the path that will lead him to growing and changing in the best possible ways. The Flash’s pilot is important because it lays the foundation for the rest of this show: optimistic, fun, engaging, inspiring, and ambitious. What a way to begin a series. I love Barry's voiceovers. They're just so energetic. “The future will be here faster than you think.” HAAAAAAAA. *hums “I Know Things Now” from Into the Woods* Also: isn't it great to go back and rewatch earlier episodes of this show, knowing what you know by the end of the season? Barry/Henry scenes are some of the best and most emotional in the entire series and the one in this episode at the end was no exception. DUN-DUN-DUN. Sketchy Dr. Wells is being sketchy in the end tag!